It has been years since I visited Tanglewood, the summer home of the Boston Symphony Orchestra. This year, with some encouragement from friends, Marita and I decided it was time to go back. We traveled from the Eastern Townships of Quebec – where we can usually be found at this time of year – taking a scenic route via secondary roads through Vermont so that we could visit Stowe for the first time. We had an excellent lunch on the backyard patio of the Whip restaurant, part of the Green Mountain Inn in Stowe, and marveled at the breathtaking ski slopes all around us. We arrived in Lenox about 5:00 pm and checked into the Yankee Inn on Route 7. It’s a very ordinary motel but thanks to the crush of music-lovers from Boston, New York and almost everywhere else, they can charge $225 per night! In Lenox, we joined our friends for dinner at a new restaurant called the Firefly – a little rushed because we had to make the BSO concert at 8:30 pm – but what we sampled was first-rate. Marita raved about a terrific gorgonzola penne; not as good as a now legendary pasta of the same description enjoyed in Trinidad, of all places, years ago, but excellent nonetheless. 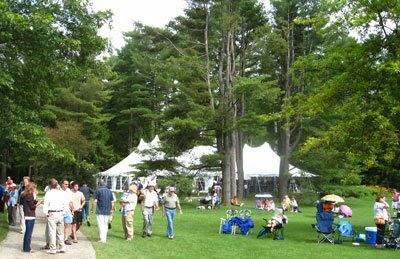 Surely Tanglewood must be considered the "Rolls Royce" of all American summer music festivals. It started the trend in the mid 1930s, and it stands today as a model of how such things should be done. Not only is it the summer home of one of the world’s great orchestras – the Boston Symphony - it is also a music school which perennially attracts the crème de la crème – both teachers and students. To make the argument even stronger, Tanglewood sits on some of the prettiest real estate in the Berkshire mountains of Massachusetts. Incredibly, this mecca of music-making was conceived and inaugurated by conductor Serge Koussevitsky in 1936, during the depths of the depression. Shortly after its establishment, America was engulfed in a world war. The festival closed shop during the war years; rationing of rubber, steel and gasoline meant that few Americans had the means to travel hundreds of miles to a music festival. Fortunately, Tanglewood outlived the war and remains today a marvel of imagination and inspiration. I never had the pleasure of attending Tanglewood as a student – following in the footsteps of the likes of Bernstein, Foss, Abbado, Maazel, Ozawa, Dohnányi, Mehta, Michael Tilson Thomas and so many others – but I was often a member of the audience in the 1970s. I recall with great joy a performance of a lean and lively Messiah and a thrilling Elgar First Symphony conducted by Sir Colin Davis and a resounding and mesmeric Berlioz "Requiem" conducted by Seiji Ozawa. Then there was Scott Joplin’s "Treemonisha" conducted by Gunther Schuller. I also loved the Prelude concerts with members of the Boston Symphony playing chamber music, and not least of all, the numerous events put on by students at the Berkshire (since renamed the “Tanglewood”) Music Center. These gifted young people invariably played with remarkable skill and enthusiasm. Peter Oundjian conducted the Boston Symphony at the Tanglewood Shed our first night there, with Joshua Bell playing Chausson’s “Poème” and Saint-Saens’ Introduction and Rondo Capriccioso. As a former violin soloist himself, Oundjian was an ideal accompanist, especially since Bell played with a lovely but somewhat unpredictable improvisatory quality. According to the program notes, the Chausson was last heard at Tanglewood in a performance by the same Joshua Bell in 1999. Few other violinists play it these days but it remains a unique, brooding masterpiece. We had good seats in about the 10th row on the extreme right of the stage. Not enough violins given our seat locations but otherwise very good sound. Incidentally, famed architect Eliel Saarinen submitted the original plans for the Shed back in 1936, but the plans were too elaborate and too costly so the Boston Symphony settled for something much more modest from local Stockbridge engineer Joseph Franz. The Shed we enjoy today is still pretty much the handiwork of Franz, and he deserves much of the credit for its surprisingly good acoustics. Earlier in the concert Oundjian had conducted Ravel’s “Alborado del gracioso” and after intermission led a very good performance of the familiar Mussorgsky-Ravel “Pictures at an Exhibition.” Particularly impressive was the tenor tuba solo in a very slow Bydlo; more expressive than I have ever heard it although there were some slips near the end. “The Great Gate of Kiev” was also slow and a little ponderous but the climaxes at the end with resplendent bells were spectacular. 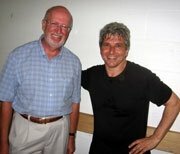 After the concert, we made our way backstage to say hello to Peter, whose father had occasionally attended my concerts in Toronto. Good Eats, Pouring Rain, and Shattered Hopes for Great Golf! Our friends had arranged golf for the men in our party at the Taconic Golf Club in Williamstown, about a 45-minute drive north on route 7. Unfortunately, the weather had other ideas. We drove up in pouring rain but it stopped soon after we arrived and we prepared ourselves to get a round in after all. After waiting an hour we started to play. The radar at the club indicated the rain cell had moved on and that clear weather would last through the afternoon. We got to the third hole and the rain came again, this time even heavier than before. The professionals play through rain and only give up in the face of thunderstorms, but there was so much water on the greens here that putted balls barely moved and nearly every fairway had large pools of water. The management at the Taconic Golf Club wisely closed the course for the rest of the day. With time on our hands we drove east to North Adams to visit the art gallery set up in an abandoned factory and known as Mass MoCa (Massachusetts Museum of Contemporary Art). North Adams was a factory town for most of its existence and this was a complex of 27 buildings, renovated when the factory gave up. The facility was built between 1872 and 1900 by Arnold Print Works, a textile printer. Thousands of people had jobs at the print factory in its heyday but times changed and the factory closed in 1942. Sprague Electric Company, a capacitor manufacturer, re-opened the facility. Sprague flourished for many years but finally lost out to competition in cheaper markets and closed down in 1985. The town of 18,000 was devastated. All 4,000 jobs went to the southern states and then to the Third World. North Adams became a depressed area almost overnight. The town remains a shadow of its former self but the once forlorn factory complex has been given new life as a vast and imaginative art gallery. At Mass MoCa there are rooms full of recent paintings and sculptures and several exhibits with an environmental angle. It was all stimulating and wondrous to behold in such an unlikely place. Two of the curated exhibitions had special merit: “Badlands: New Horizons in Landscape” – contemporary artists giving us new insight into the world around us - and “Eastern Standard: Western Artists in China”, a timely show with all eyes on the Beijing Olympics this summer. The Mass MoCa complex also has offices and restaurants and we had dinner in an eatery called Café Latino. Its menu was just as creative as its surroundings. After dinner, we made the short drive back to Williamstown for the Williamstown Theatre production of Feydeau’s “A Flea in Her Ear” in a new version by David Ives. John Rando directed a fast-paced and very funny production with terrific sets and finely-tuned ensemble acting. Mark Harelik was particularly outstanding as both Victor Chandebise and Poche. There may never have been quite so many laughs in the disreputable Frisky Puss Hotel. The Williamstown Theatre has been in business for 54 years and has seen the likes of Gywneth Paltrow, Blythe Danner – her mother – Christopher Reeve, Joanne Woodward, Frank Langella and many other New York and Hollywood luminaries over the years and under current artistic director Nicholas Martin it remains a summer theater of the highest quality. While the principal actors are all experienced professionals, the Williamstown Theatre Festival also offers training for hundreds of young people each season. In its way it is the theatrical counterpart of the Tanglewood - Tanglewood Music Center combination. It was back to the Haven the next morning – this time for excellent pancakes with our Sunday New York Times - then back to Tanglewood. The plan was to have a picnic on the lawn before the concert. Rain was again in the forecast and the pessimists among us feared the worst. Fortunately, the rain held off until the concert began. No problem for us because we had tickets inside the Shed, but while we stayed dry, we were too far away from the stage to hear much music, especially from Yo Yo Ma in the Lalo Cello Concerto, a poor piece anyway. The conductor - Mexican-born Carlos Prieto - was in over his head. The orchestra sounded second-rate. The performance of Rachmaninov’s “Symphonic Dances” lacked both fire and melancholy. Prieto opened with selections from Albeniz’ “Iberia” in orchestrations by Arbos. These are genre pieces of no great distinction. Fine for a travelogue but not for a serious concert. But then this is Tanglewood - probably sounded just right if one were stretched out on the lawn with a glass of wine in hand, taking it in through the external sound system. The Shed seats 5,000 and the lawn another 18,000! After the concert we went back to our chairs on the lawn and chatted, a nice way to wind down and avoid the traffic jams as everyone tries to leave at once. Later, we drove down to Great Barrington ‘the back way’ on Hawthorne Road through Stockbridge for dinner at a superb restaurant also owned by the same people who run Café Latino. It is called Allium on Railroad St. Wonderful Spanish tempranillo called Torremoron. The manager/owner claimed to have visited the town where this wine is made. It was only $36 and it was rich and smooth. Marita had a tasty Turkish Lamb that rivaled a wonderful risotto praised by others at our table. We finished off with panna cotta and a selection of house-made ice creams. Our Tanglewood trek this year came after an absence of more than twenty years and we got involved after all the plans were set in motion. We had a great weekend, but in retrospect we might have tried to plan it differently. After all, the musical highlight of the weekend was Tchaikovsky’s “Eugen Onegin” conducted by James Levine and starring Renée Fleming. Levine had to cancel due to kidney surgery but by all accounts Sir Andrew Davis filled in admirably. We were otherwise engaged with Feydeau in Williamstown. 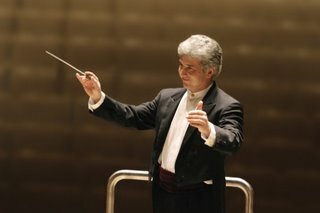 Tanglewood remains the unique musical paradise BSO conductor Serge Koussevitsky created more than 60 years ago. His successors have both honored his memory and added to its reputation. Physically, Tanglewood has grown over the years with the addition of more land and a second major concert facility, but the beauty of the site is remarkably unspoiled. The lawn seems as green and spacious as it ever was, and no signs of commercialism have been allowed to penetrate this musical oasis. No wonder the board of the Toronto Symphony is using Tanglewood as a model as it explores Niagara-on-the-Lake as a possible summer home.